Update: The Daily News identified the deceased victim as Arline Smeal. A motorist killed one senior and severely injured another when the unattended van he was driving, left idling and in gear, backed across an Astoria intersection and onto the sidewalk. NYPD filed no charges. The crash occurred at around 2 p.m. at Broadway and 32nd Street. 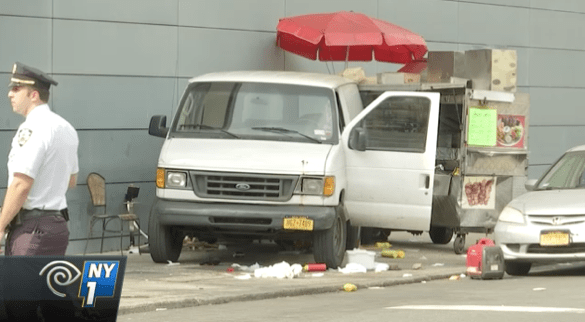 After the driver, a 29-year-old man, exited the Ford van, “the vehicle began to roll backwards on 32nd Street and struck two pedestrians before colliding with a food cart,” according to NYPD. The van hit an 80-year-old woman and a 71-year-old man — who according to WNBC and the Daily News operated the food cart — before crashing into the wall of a building. Both victims were taken to the hospital in critical condition. The woman died from her injuries. Police have not released her name, pending family notification. “The back left wheel and the front right wheel rolled over this old lady’s neck and then hit an older gentleman, knocked the souvlaki stand, and it was just devastating,” one witness told WCBS. The van “pushed the food cart about 25 feet and clipped the owner in the back of the head and then rolled over his legs,” the News reported. WPIX posted video of the van rolling through the intersection. The circumstances of yesterday’s crash are very similar to the crash the led to the adoption of the state’s vulnerable user law. In 2009, a van left unattended by a commercial driver backed onto a sidewalk in Chinatown, killing toddlers Diego Martinez and Hayley Ng. The crash prompted state legislators to establish the offense of careless driving for cases where a driver injures or kills a pedestrian or cyclist while failing to use due care. NYPD has a poor record of enforcing the law. As of this afternoon NYPD has filed no charges and issued no tickets for yesterday’s crash. The department’s public information office told Streetsblog the investigation is ongoing. This is a clear violation of Hayley and Diego’s Law, is it not? Or does an NYPD officer have to personally witness the idiot exiting his vehicle while leaving it running and in-gear? I’ll vote for the mayoral candidate who pledges to have crash investigations performed by the medical examiner, the Dept. of Health, or some other party that bases its work in fact and science – or just about anyone but NYPD. How is this not even negligent manslaughter? Let some crickets out of a jar onto a subway where nobody gets harmed and you’ll get charged with reckless endangerment. Kill another person through your reckless actions and you get charged with nothing. The cognitive dissonance is overwhelming. Because it was, according to a bystander, a “freak accident”. No one could have predicted or prevented the results of leaving a running vehicle in gear! Is there a reason the NYPD hasn’t been shut down yet? It’s obviously completely worthless at “protecting” or “serving” the public. I would support the mayoral candidate who promises to liquidate the NYPD. I don’t think there’s any legal requirement to have an NYPD, though I think the Commissioner is required to exist. It’s pretty obvious that there is no criminal justice system in New York City. It’s time for private prosecutions to be brought back.